I think I’m going to call this the exhaustion edition! It isn’t so much the parent-of-newborn lack of sleep…I have three kids under five so…sleep? What’s that? It is more that I bit off more than I could chew! I set aside time this summer so I could work on some personal projects and then I just took on too many other things. I have a Smart Summer Challenge over on my education blog and I am a community leader over at the Random House Kids Read & Play Summer Fun Community. In the interest of my sanity, I think I am going to take a break from posting the linky weekly and leave this one open through August. Hopefully this will give me more time to put up some other posts here that I have planned! Please check out and comment on each others’ posts…that’s what makes people want to come by and leave their links! Comments are catnip to bloggers! Please leave the URL to a SPECIFIC post (or posts…you can add more than one), NOT the main page of your blog. The linky is up ALL SUMMER! So, stop by anytime! Having trouble adding your link? Add a comment or tweet @ArmyWivesLives and I will add it for you! Your post must be relevant to the military family experience on a personal blog (no corporate blogs). I also retain the right to delete links to any posts that contain hate speech, plans to commit illegal acts, or anything that violates the spirit of this carnival or U.S. law. Need a reminder that the carnival is up? Subscribe to Army Wives Lives by Email and you will get a digest of posts, no more than once a day (probably more like 1-3 times a week) when I post. Want MORE Army Wives’ Lives? Fan the facebook page! Want to share more of the FABULOUSNESS that is you? I accept guest posts and post interviews! Without further ado, let’s get to the posts–I hope you’ll participate and visit these wonderful Military Family Bloggers–and feel free to check out previous editions for more great Military Family Posts! Hope everyone had a wonderful Fourth of July weekend, celebrating America’s Birthday. Welcome to the July 11 linky! Right now, I feel just like a slice of apple pie. We enjoyed a weekend out on the North Fork of Long Island with family. My mother-in-law, bless her energy, led the kids in a Fourth of July parade around the neighborhood. The kids rode their trikes and climbed trees and chased fireflies. We held an election and voted for our favorite ice cream flavor. We had a barbecue, finished off with S’mores, and followed by fireworks. We watched the Fourth of July parade. We played mini golf. My husband took the two older kids to the beach. Then, this past weekend, my daughter had her dance recital. So, it has been a week and a half of wholesome family fun! Our Troopaws giveaway winner is: Amanda Gardner. I’ve sent you an e-mail so please check and reply! And don’t forget to check out Troopaws and visit them on Facebook. The linky is up ALL WEEK! So, stop by anytime! 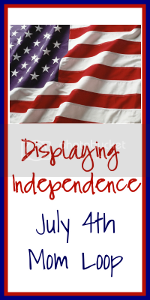 Military Monday Linky – Happy July 4th! Here I go again, leading with my strengths…I figure the kids are cuter than I am witty. I’m taking am Independence Day weekend break and figured many of you might do the same. So, I extended last week’s linky into this week. The linky is open, though, so feel free to add more posts this week and I’ll be back with a fresh linky next week! While you are here, I hope you will enter this Trooppaws Giveaway I am hosting for this clever and compassionate entrepreneur who designed these stuffed animal dogs using military uniform fabric–a great gift for our young warriors who fight their own battles on the home front when a loved one deploys. While we’re talking carnivals…I am also planning (assuming I can get an Internet connection), to visit the “Mom Loop” 4th of July Link-Up! Next Military Monday is July 4 so feel free to share links about Independence Day, even if you do not usually blog about Military Family Life! Army Tanker’s Wife has some ideas about how to make a roadtrip fun without your soldier. The Albrecht Squad made me cry with this post honoring a fallen hero. And then Army Wife Style made me laugh with a post about military spouse quotes and glitter graphics. I think I should just post cute pictures of my little Army Brats each week…because that’s going to be better than anything else I write! We’re adjusting well to our new little addition and looking forward to Captain Dad actually being home for an entire weekend (*fingers crossed*). Here are some of the fun posts people shared last week…please remember to add a link to a SPECIFIC POST in the linky, especially if you want to see your post featured here! It is PCS time for Tonya at Christian Mommy Writer and she’d love your best tips! Lily of Adventures of a Military Family of 8 is Tired of the Barriers…and wants to get to know you a bit better. Military Mondays – New Baby Edition! I hope you all had a wonderful Memorial Day weekend with your families. Ours finished with a real bang as we welcomed a new Army Brat to the world. I went into labor late Monday night and Conrad Ulysses joined us on May 31 at 5:18am. He weighed 9 lbs, 15 oz and measured 22.5 inches. Conrad’s first name is from my husband’s grandfather, an Army veteran of World War II. It was a very easy delivery compared to my first two and we left the hospital the next day. Big sister and brother seem thrilled with their new sibling although they do wish mommy wasn’t napping during the day. We had a lot of outstanding links last week both from “regulars” and from some other bloggy friends who had relevant posts celebrating Memorial Day. Here are a few I would like to highlight. Please take a moment to stop by, say hi, and leave a comment if you enjoyed the post. Bloggers love comments! Multitasking Mama talks about her anxieties in becoming a Military Mom. What are you doing this Memorial Day? I hope you will join this Military Monday Family Blogger Linky. Now that I am a part of the military family community, I feel like today is a day of ghosts. I can’t see them but I can sense them surrounding the men and women who have served. Even those who came back with their entire unit usually know others who made that ultimate sacrifice. And it is not just their brothers and sisters in arms but the other lives they have seen snuffed out during their tours of duty. The living carry these ghosts and a sense of loss–even, or perhaps especially, in times of great joy. It seems the dead are there. This world is a world of lies. And here’s to the next man who dies. ‘Tis the Hurricane’s blasted breath. Grows cold in the grasp of death. Hopefully by now I have given birth to baby #3…so I would LOVE if you would help spread the word on your blogs, twitter, and facebook and also help support one another by reading and commenting on each other’s posts. Here are a few posts I would like to highlight from last week’s linky. If you haven’t already, you might want to check them out and maybe leave a comment if something interests you! Army Blogger Wife talks about Retirement at a young age. Amy at …And The Adventure Continues is talking redeployment (that’s coming home for all you civilians) and asks her husband some interesting questions. Linky Tools was down this morning but should be working now. If it isn’t working for you, please leave your link in the comments. THANK YOU! Welcome to the Military Monday blogger link-up for May 23! Well, it is almost my due date (May 25) and it is almost Memorial Day (May 30). What do you have planned for Memorial Day? Family time? Recognition of our troops? Remember those who served and made the ultimate sacrifice? Learning activities with the kids? Since I’m due May 25, I am pre-scheduling the carnival and guest posts throughout this month and would LOVE if you would help spread the word on your blogs, twitter, and facebook and also help support one another by reading and commenting on each other’s posts. At Fabulous Army Life, Traci shares the emotional roller coaster leading to deployment and now I’m crying. Few “civilians” would think of it but every military spouse knows about the mountain of gear–check it out at Army Blogger Wife. Kristi experiences the ever-inconvenient (but necessary) “random vehicle search“–do you have a story? If you have a moment, I would appreciate a vote as one of the Top 25 Military Family Blogs. You are able to vote daily AND you can vote for multiple blogs–so please vote for all of your favorites through May 25, 5PM PST! For the list up as of now, I recommend my own Army Wives’ Lives, Army Wife 101, Mrs. Mama Hen, Household 6 Diva, Military Duty Stations, Military Wives Saving, Army Tanker’s Wife, and This Fabulous Army Life. Are you nominated? Let me know so I can vote for you, too! Welcome to the Military Monday blogger link-up for May 16! If luck is with me, I will give birth sometime in the in the next week. My children like to pick the least convenient times to show up. My daughter was two weeks before her due date (arriving while her Daddy was en route from Iraq for R&R–he missed the birth by two days) and my son was two weeks post due date (arriving after my mother finally had to go back home and go back to work). If you have a moment, I would appreciate a vote as one of the Top 25 Military Family Blogs. You are able to vote daily AND you can vote for multiple blogs–so please vote for all of your favorites! For the list up as of now, I recommend my own Army Wives’ Lives, Army Wife 101, Mrs. Mama Hen, Household 6 Diva, Military Duty Stations, Military Wives Saving, Army Taker’s Wife, and This Fabulous Army Life. Are you nominated? Let me know so I can vote for you, too! Military Duty Stations has tips for sorting and organizing paperwork–which we sure have a lot of in the military! Welcome to the Military Monday blogger link-up for May 9! If you are a mom or have a living mom or grandmother, I hope you had a wonderful time celebrating motherhood this past Sunday! I am looking forward to bringing a third little one into this world, hopefully sometime this month. So, I am pre-scheduling the carnival and guest posts throughout this month and would LOVE if you would help spread the word on your blogs, twitter, and facebook and also help support one another by reading and commenting on each other’s posts. If you have a moment, I would appreciate a vote as one of the Top 25 Military Family Blogs. You are able to vote daily AND you can vote for multiple blogs–so please vote for all of your favorites! For the list up as of now, I recommend Army Wives’ Lives (of course ;), Army Wife 101, Mrs. Mama Hen, Household 6 Diva, and Military Duty Stations. Are you nominated? Let me know so I can vote for you, too! And if you have a guest post to offer, My e-mail is candace [at] armywiveslives [dot] com. Guest posts should be from military spouses and should be primarily non-commercial in nature. You’ll have a signature where you can add your blog(s) and/or website(s). Please let me know! What do you think? Blow for freedom? Changes nothing? May spark a backlash?